Pressure cookers are often used in home kitchens to cook lentils, beans, rice, and oats. Using a pressure cooker can reduce the time that it takes to cook a meal. However, in some cases, pressure cookers have caused serious injuries, with a number of consumers reporting explosions that cause severe burns. Some prevalent pressure cooker brands include Tristar Power, Maxi-Matic, Instant Pot, Fagor America, Tabletops Unlimited, and Wolfgang Puck. If you were injured by a pressure cooker, you may have a basis to sue the manufacturer. The knowledgeable product liability lawyers at Moll Law Group are available to help victims recover damages after a pressure cooker accident. Billions have been recovered in product liability lawsuits in which our firm has played a role. 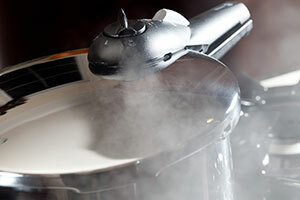 To establish a product liability claim in connection with a pressure cooker that caused your harm, you will need to show the existence of a manufacturing, design, or marketing defect. Generally, a pressure cooker does not explode under normal conditions, and if it does, it is possible that it has a defect. Some reported defects in pressure cookers include inadequate venting of steam that results in explosions, faulty gaskets that allow a pot to be opened even under high pressure, or inadequate seals for lids, which can result in intense, hot spills. Manufacturing defects are flaws in how the pressure cooker is made. Typically, when there is a manufacturing defect, it is a one-off problem, and other pressure cookers in the line do not have the same problem. For example, a gasket that simply was not molded correctly might be defectively manufactured. Design defects occur in all of the products in a line because the flaw exists in the design of the pressure cooker. Different jurisdictions require you to prove different elements in connection with design defects. Generally, to show a design defect, the product must have posed a foreseeable risk when it was made as intended and used for its intended purpose. Your product liability attorney may also need to show that there was a feasible alternative design that the manufacturer could have used to produce the pressure cooker within its budget, such that the pressure cooker could still be used for the same purpose. Sometimes there are marketing defects. When a manufacturer knows that there are risks associated with the use of a product, it has a responsibility to provide warnings to consumers. These warnings should be adequate to actually warn consumers of the risks of using the pressure cooker in certain ways, or of using the pressure cooker at all. Depending on the state, you may be able to hold a manufacturer strictly liable for a defective pressure cooker if you can prove a defect, and the defect caused your injuries. In certain jurisdictions, however, you must show negligence. In other words, you need to show that the manufacturer owed you a duty and breached that duty in how it made, designed, or marketed the pressure cooker. Proving a defect may require proof of additional elements. In some design defect cases, for example, it is necessary to retain an expert to show that an alternative design was available. If your attorney is able to establish a manufacturer's liability, you can recover compensatory damages for pressure cooker injuries. These compensatory damages could include emergency hospital treatment, medical bills, surgery bills, disfigurement, scarring, loss of enjoyment, mental anguish, pain and suffering, and loss of consortium. The scope of the damages and what can be recovered depends on your particular situation. When an accident victim suffers third-degree burns in visible places, for instance, they may be able to recover more compensation for scarring, disfigurement, surgery expenses, and pain and suffering than someone would in a case in which they suffered a first-degree burn in a place that is normally concealed by clothing. If you were harmed by a defective pressure cooker, the lawyers at Moll Law Group can evaluate whether there are grounds to bring a product liability lawsuit. We represent victims of defective products across the country, including in Illinois, California, Florida, Michigan, New York, Ohio, Texas, and Pennsylvania. Call us at 312-462-1700 or contact us online.